Please come out and join us at Davis County Fairgrounds sponsored by Porsche Salt Lake City. This is one of our favorite autocross venues, offering plenty of space to let your Porsche stretch its legs. What is autocross? 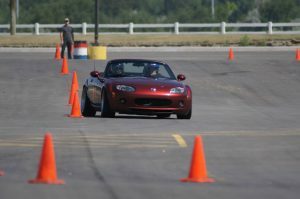 Autocross consists of navigating your car as quickly as possible through a course made of cones. It’s a great way for any licensed driver to improve skills in his or her weekend sports car or everyday street car. We provide coaches to new autocross drivers who will ride with you and provide pointers. For safety reasons, there is only ever one car on the course at a time, and the course is designed to keep speeds relatively low. Each of your runs will be timed, so that you can evaluate how much improvement you make on successive runs throughout the day. Come on out and give it a try. You will be AMAZED at how much progress you will make in one day! Without exception, people who autocross comment about how their autocross experience has improved confidence and ability with everyday driving on the street.